The Animal House Project is a charity which focuses finding shelter and food for pets that have families with financial problems. The Animal House Project offers canned food to a variety of different pets. Located out of Pottstown and Downingtown, AHP has given hope to many families facing financial crisis by helping take care of their pets. The group says that their main goal with the organization is to keep pets out of shelters and to help the struggling families by giving the, one less thing to worry about. Their services include a Veterinary Aid program, which provides help to families by offering cheap and quality vaccinations, spaying, and neutering for the client’s pets. AHP has been around and helping families since 2001. They donated 190,000 lbs of dry food and 58,000 cans of food in total in 2017. AHP works on a compete volunteer staff and makes all of it’s money through donations and food drives. 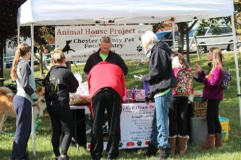 The Animal Housing Project is very well respected and helpful non-profit organization. Go http://animalhouseproject.org/ to make a donation to help a family in need.